BACKGROUND: Tansy ragwort is a Eurasian weed first reported in Oregon in 1922. It spreads primarily by seed. 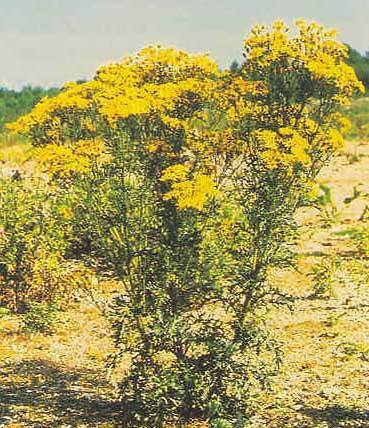 A single tansy ragwort plant may produce up to 150,000 seeds, which may remain viable for up to 15 years. All parts of this weed are poisonous. It causes liver damage to cattle and horses, while sheep are affected to a lesser extent. DESCRIPTION: Tansy ragwort is a biennial or short-lived perennial. Seeds germinate the first year and form a rosette of raggedly lobed leaves up to 9 inches long. Flower stalks develop the second year, growing up to 6 feet tall, with many branches near the top. Stem leaves are 2 to 3 times pinnate with blunt tips and blades that attach directly to the stalk. Numerous yellow, 1-inch wide, daisy-like flower heads with golden or light brown centers form at the tip of each branch from midsummer to fall. Seeds are tiny and are tipped by hair-like plumes that carry seeds for long distances. DISTRIBUTION: Widespread on the coast and Cascade mountains of Washington and Oregon. CONTROL: Biological control agents provide fair to excellent control west of the Cascades, but have not been tested in Idaho. Herbicides are available.